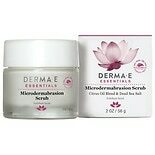 Shop Derma E Microdermabrasion Scrub (2 oz. )2 oz. $2699$26 and 99 cents$13.50 / oz. The healthiest and newest skin on your complexion isn't visible to the eye. New skin that develops deep within the tissue in the layer is known as the dermis. Your body continuously sheds skin cells, so that the new skin gradually moves toward the surface and becomes visible. By the time you can see it, that tissue has often become damaged and flawed. 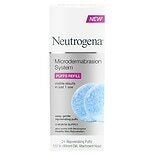 Exfoliating the complexion removes old tissue more quickly, so that newer skin in better condition can be revealed. Microdermabrasion is a form of exfoliation that involves the use of very tiny particles of gemstones or minerals. Because such tiny particles are used to loosen the tissue, microdermabrasion is gentler on the skin than other exfoliation methods, making it safer for people with more sensitive complexions. The exfoliating actions of microdermabrasion can be used to address many skin care conditions and concerns, including acne facial scarring, skin discoloration, fine lines, deep wrinkles and folds and signs of sun damage that come with age. In addition, microdermabrasion can be used to promote a healthy glow to the face tissue to leave the complexion looking rejuvenated and healthier. Microdermabrasion was originally only offered by medical professionals such as plastic surgeons, dermatologists and in spas, where special equipment that included a diamond or gemstone tipped wand was used to remove dead skin. 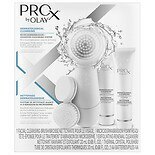 Now, skin care companies produce products that allow you to recreate the exfoliating actions of microdermabrasion at home. One option for at-home use is to purchase a microdermabrasion system. Like the equipment used for clinical treatments, these systems have a wand or are a hand-held device that you gently rub against the skin. Their heads are tipped with minerals, which create friction to remove dead skin. 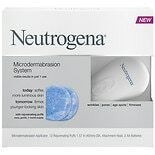 Many of these systems come with topical skin care products that enhance their effectiveness. Some skin care companies make topical scrubs that contain tiny particles of minerals to offer a less intensive form of microdermabrasion than at-home systems. 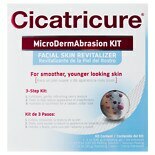 Walgreens has a variety of microdermabrasion systems and scrubs available to help you address your skin care concerns. Find the ideal solution to help you experience microdermabrasion in the comfort of your own home.